Hyundai engineers have taken the company's new Genesis rear-drive platform — the one destined for the company's new, 350+ hp, V8-powered luxury flagship — and created a sporty, rear-drive two-door. At SEMA today, the company's VP of product development John Krafcik revealed a sketch of a new variant. 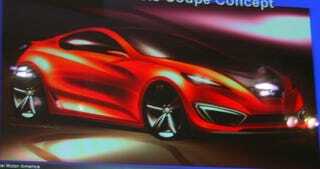 It'll be dubbed the Concept Genesis Coupe when it shows up at the Los Angeles auto show next month. The prototype will be powered by a 3.8-liter V6 producing 300 horsepower, with a five-link rear suspension. The production model will appear at the New York auto show in 2008, before hitting dealerships subsequently. Yes. Rear drive, 300 horsepower, Hyundai. Think that over.